At Broadoak School we are committed to improve attendance and punctuality as this will have an impact on your child’s attainment. Pupils should report to their form rooms at 8.37am for registration which starts at 8.40am. Pupils who are late to school will be automatically placed into detention that lunchtime. Pupils who are more than 10 minutes late to school or are late to period 5 in the afternoon will also be detained for 30 minutes after school on the same day. Pupils who arrive late on 2 or more occasions within a week will be placed into INTEX for a day. A telephone message from home on the first day of a pupil’s absence is vital and will prevent us from contacting the home. If the school have not been contacted about a pupils absence, in an effort to encourage attendance, it is our policy to telephone parents on the first day of a pupil’s absence. This system is a genuine attempt to stop truancy and prevent children being at risk by wandering the streets without their parents’ knowledge.Your child should also bring a note of explanation for his or her Form Tutor on returning to school. We believe that any absence from school, for whatever reason, is detrimental to a child’s long term life opportunities, so should be avoided if at all possible. 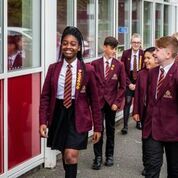 Regular and punctual attendance at school is both a legal requirement, and essential for pupils in order to maximise their educational opportunities. Sections 444A and 444B of the Education Act 1996 empowers Headteachers or their nominated deputies to issue Fixed Penalty Notices in cases of unauthorised absence from school, where a parent/carer is considered capable but unwilling to secure an improvement in their child’s attendance at school. If a child of compulsory school age fails to attend regularly at school his/her parent/carer is guilty of an offence under Section 444 Education Act 1996. If unauthorised absences continue after the period of notice, proceedings will be taken in accordance with Section 444(1) or (1A) Education Act 1996. A formal written warning of the possibility of a Penalty Notice will be issued to parent(s) and a period of 15 school days given to improve attendance. Where there is no improvement a Fixed Penalty can be issued. The amount of the penalty is £60 if paid with 21 days of receipt of the notice. This rises to £120 if paid after the 21 days but within 28 days. If the payment is not made the parent/carer(s) will be prosecuted for the original offence and could be subject to a range of fi nes or other disposals in the Magistrates’ court. Penalty Notices and other sanctions will be used only where parental cooperation in this process is either absent or deemed insuffi cient to resolve the problem. They will be used as a means to support parents/carers to meet their responsibilities in law, and where there is a reasonable expectation that their use will secure an improvement. Broadoak School is considerate and mindful of the emotional wellbeing and social circumstances of every child who is looked after. Looked after children will be given individual consideration and consultation with other professionals to offer the most appropriate support with attendance will take place where necessary. During the lunch break pupils must stay on the school premises unless they can be picked up by a parent or relative to ensure their supervision and safety. No other alternatives are available. Children who stay for a school meal are expected to remain on the premises under the supervision of school staff for the whole of the lunch break. NO RESPONSIBILITY CAN BE ACCEPTED FOR ANY PUPIL WHO LEAVES THE SCHOOL PREMISES IN DEFIANCE OF THIS RULE. At the end of every half term the school will write to the parents of pupils who have attendance or punctuality concerns. Support will be offered with strategies provided to enable pupils to attend school more regularly. Pupils with outstanding levels of attendance and punctuality will be presented with badges and certificates. Congratulatory letters will also be sent home. Pupils will also be given the opportunity to attend termly reward trips to celebrate their success. Amendments have been made to the 2006 regulations in the Education (Pupil Registration) (England) (Amendment) Regulations 2013. From 1st September 2013 this prevents headteachers from authorising holidays/absence during term time. Leave of absence from school will only be authorised in exceptional circumstances.